As a huge fan of Veronica Mars, when I saw the comparison's from that series to this book I was very interested. 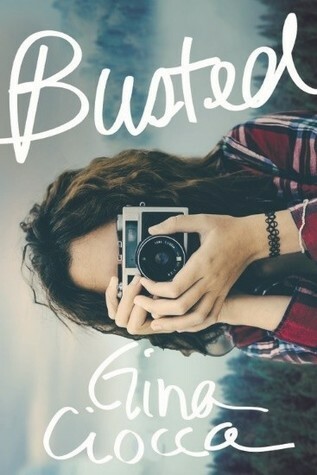 Having now read Busted by Gina Ciocca I would say that it's not exactly the same, but it's up the same alley. The story follows Marisa as she becomes popular for hunting down boys that are cheating on their girls. Does she want this job? Not really. She just kind of gets suckered into it. However, she is decent at it and she finds herself in one situation she did not thing she would. Falling for a guy that was not hers to fall for and dealing with crazy teenage girls. The first half of the book was good, but didn't move as fast as I'd liked. I felt it drew out and there was a lot going on. But quickly I found that all those things going on slowly started clicking together to form a more cohesive story with a focus. I love Marisa. She was your average teenage girl with boy problems, homework problems, Friday night football games, and parents. While being average, she is nothing but! Accidentally getting wrapped in a spy-for-hire gig to help an old "friend", this book is packed with something for everyone. I loved TJ as well. He was someone I would hang out with. The two of them were instantly a pair I could see getting together. They were such well developed characters, which made this story so much better to read. Ciocca writing style made the story flow well. There were no choppy endings or cliffhangers that weren't story lines welcomed back in the next chapter. All the supporting characters where well developed and added something to the story. I also was pleased with the lack of down time in this story. In many novels you find chapters filled with information that comes across as space fillers. Busted didn't have those. Every chapter had pertinent information that lead to filling in the story and bringing it to a peak and wrapping up at the end. I loved this book and anyone who enjoys easy reads with a bit of mystery and romance should pick up this book. You won't regret it. Sign into Goodreads to see if any of your friends have read Busted.